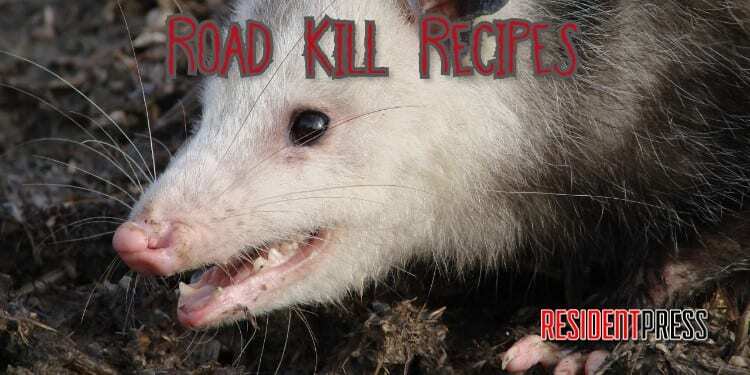 Learn how to make Possum Pot Pie in minutes to make the road kill worth it! We all have those sneaky possums that like to hide in our trash cans outside looking for a late-night snack to munch on. Why not make that possum into a delicious pot pie? Possums are easy to trap if you have cat or dog food. A local trap can be purchased from a local feed store, hardware store, or sporting goods store. Once you have a trap set in place, your possum should come lurking around! If you can’t catch the possum, don’t worry! Just watch the roads, especially in the rural areas! There is always one on the road! However, it must be a fresh kill. If not, you will encounter, bugs and lots of germs! If you do a touch test, you will be able to tell if it’s a fresh kill, however always make sure before stopping for any Road Kill Supper that you check for oncoming traffic. We do NOT want any accidents! Now, when checking to see if the possum is ok to eat if found on the road, a warm touch is good (unless it’s a hot summer day). If it is cold, leave it for the buzzards! Now, just use a clean small shovel or spatula to scoop up the remains, place in a large zip lock bag. Take home immediately and place in the refrigerator until you are ready to debone and clean. Make sure you don’t leave it in there for days though especially if you have your kids’ friends spending the night. It might scare the kids if they open the refrigerator and see a dead squished possum! Once a possum is caught or found, you must skin the possum. I suggest watching a YouTube video for further explanation on this technique. There are so many ways, and you will just have to find the technique you like the best. After the possum is skinned, you will then need to detach the meat from the bones. I suggest using the thigh meat. Now that you have extracted the thigh meat, boil the meat with water covering it in a medium size pot. This should take approximately 30 to 40 minutes depending on how fat your possum was and how much meat you actually ended up with. When cooking a possum, remember they are greasy! They have eaten lots of variety of things, so their chemical makeup makes them almost a grease monkey! Once the meat is finished cooking, remove meat from the pot with tongs. Cut meat into small chunks. Now, you are ready to make your Possum Pot Pie! Preheat the oven at 350 degrees. Sautee the onions on medium heat in a skillet with 2 tablespoons of butter. You will basically need to just keep turning your onions, so they don’t stick. But cook until they are soft and no crisp left. Next, you need to make your roux. In another small skillet, add the milk, possum broth, flour, salt, and pepper. Whisk on medium heat until the roux comes to a boil. It will need to thicken just a bit but not too much, so keep watch on it! Now, pop those frozen veggies in the microwave and cook as directed. Then, remove from the microwave and drain any excess water off. Next, place one ready-made pie shell into your greased pie pan. Add the boiled possum thigh meat and veggies. Then, sprinkle with the garlic salt. Slowly, pour your roux over your ingredients. Once you have an even mixture, now you are ready to make the topping with the other pie shell. Take the other uncooked pie shell and place on top of the baked pie shell. Seal the edges together by pinching all around the sides. Next, cut slits on the top center of the pie and like a circular sun type pattern. Now, you are ready for the oven! Bake at 350 degrees until the top is golden brown! Enjoy your ROAD KILL! Stay tuned for next week’s ROAD KILL Recipe: Armadillo Stir Fry! Disclaimer: I have NEVER made this! So, if you really do attempt the recipe, I do not guarantee it’s freshness nor great taste! However, some articles read that possum is actually edible. I suggest further research before attempting a possum pot pie!